Thunderstone Quest Review - A massive box of dungeon diving adventure. I imagine that one day somebody over at AEG asked a simple, yet very important question. What is fun about playing Thunderstone (Advance)? 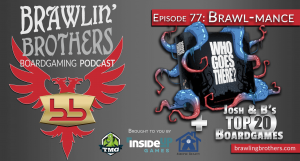 Imagining that they put together a list of all the things that make Thunderstone fun, they probably sat down with those core ideas and built up a brand new game using modern game design theory to flesh the bones out while ignoring all the rough bits that made Thunderstone clunkier then it needed to be. The end result is a familiar game that is one of the most fun filled deck building games I’ve ever played. We are talking about Thunderstone Quest. Thunderstone Quest is kind of like eating out at The Cheescake Factory. You order a pasta dish that sounds like a lovely little meal, but your server brings you enough food to feed a the cast of Les Miserables for a week. The package sent to Kickstarter backers boasts enough sets of cards to fuel a base set and 3 large box expansions. The game box is of such epic size that you would have no trouble fitting Gweneth Paltrow’s head in it (if one were so inclined). Thunderstone Quest, even without the Kickstarter bonuses is an embarrassment of excess that requires several games to play through the campaign story-lines, which is honestly just an excuse to allow you to try out all the different cards before you start dabbling with random card markets or the much over-appreciated “epic” variant. The price one pays for the sprawl of cardboard though is in table space. Never before have I seen a deck builder that used up as much space as Thunderstone Quest (not even City of Iron 2.0 or Magnum Opus). The horizontal width of the game is so great that only the largest of tables will be able to accommodate the game. As a proper gamer, I bring all this up not to complain, but rather to serve as warning that one should be prepared to ask for a doggie bag. 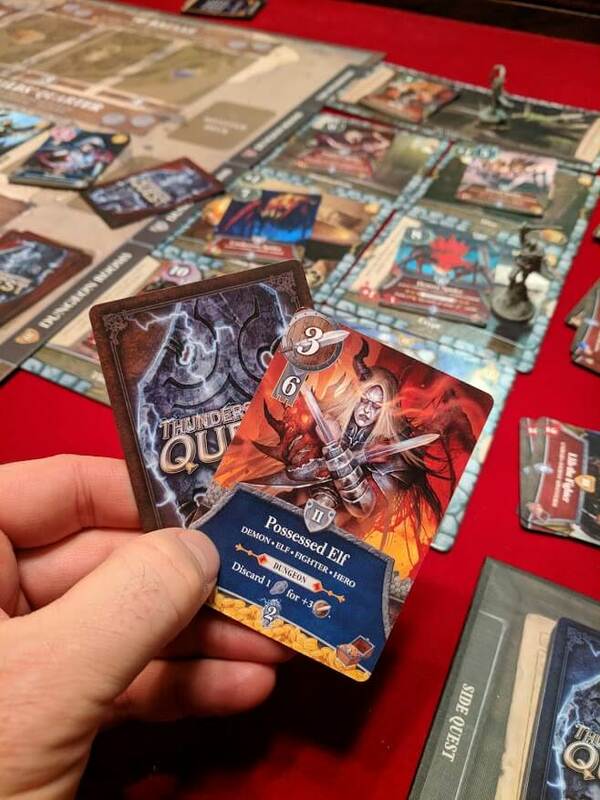 At first, Thunderstone Quest feels like a rehash of what has come before. Just like with the first two iterations, players begin a turn by picking between going to the village or venturing into the dungeon. Just like in the first two versions, you go to the village to build up your deck and level up characters while venturing into the dungeon is all about scoring points and triggering the end game. It took me exactly one round of Thunderstone Quest to realize just how much fun I was going to have with it. 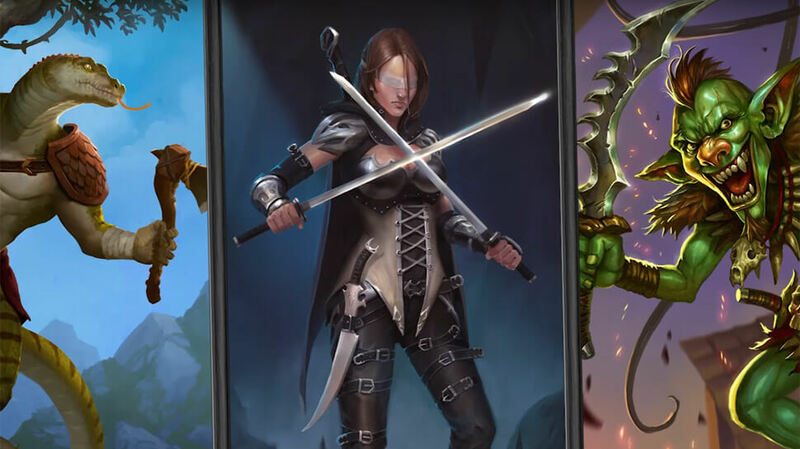 The starting cards and dungeon have been completely overhauled with combos and positive feedback loops in mind. On a turn, I can go to the village, play a card to draw more cards, buy a cool new card for my deck, level one of my heroes up, cull a starting card, heal a point of damage, buy a wooden supply token, and then if I was lucky and drew a lantern – I can even run into the dungeon to grind and level up one of my starting hero cards. I’m not being hyperbolic or just listing everything you can do. If you pull the right cards, you can do all this stuff a turn or two into the game. If I choose to go into the dungeon, I can combo my cards to max out my stats for the turn and then pick a bad guy to kill and score some xp/vp, supply tokens, or if I’m really lucky, draw a random treasure card or two. No matter where I go, I have all sorts of great things I can do to empower myself in cool new ways, that in turn allow me to do even more cool things on future turns. Thunderstone Quest feels like Thunderstone on beast mode, cranked up to 11, and chugging a five hour energy drink. Thunderstone Quest’s village only has minor rules tweaks over the previous versions, which does slightly increase the number of decisions a player gets to make without increasing complexity or fidliness. The dungeon though is a completely overhauled design that dramatically increases the variability and complexity of hunting monsters. When a player ventures to the dungeon they must map out where they are going and who they want to fight. 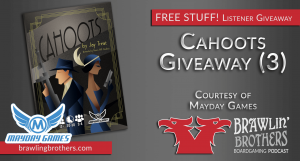 The bonus card draws and penalties you are faced with after you make your decision give the puzzle a sense of press your luck that was a hallmark of the first two versions of the game. The modular room tiles could see even more rules tweaks for players who want to home brew their game. While the game starts you with a dungeon on a 2×4 grid, you could easily up the complexity of the dungeon by randomizing a 3 x 4 grid instead or even designing your own dungeon map. The only real restriction would be for how much table space you’d be willing to set aside. The new dungeon design offers more decision making opportunity without losing sight of the fun push your luck moments. If anything, the decisions are especially heart breaking as you’ll find yourself constantly second guessing the right move. Should I “grind” my team by killing a giant rat so I can get rid of my level 0 adventurer or should I go after a higher level critter so that I can score some vp and maybe pull a super powerful treasure card. These aren’t the type of decisions players get to fuss over in most modern deck building games. While much of Thunderstone Quest is built upon its prior versions, it doesn’t feel quite like any other deckbuilding game out there. It isn’t as quick or shallow feeling as Hero Realms / Ascension / Clank!. The build up feels far more satisfying then Draconis Invasion. And the polish of the game leaves even the best Dominion expansions in the dust. Probably my favorite new element of Thunderstone Quest are the eponymous side quests each player drafts at the beginning of every game. The side quests themselves aren’t particularly revolutionary. They serve to nudge players in one direction or another with regards to their deck building strategy or in tasks to complete in the dungeon. Overall, I’ve found that quests tend to generate between 10 & 20 VP for their owners depending on how well the players leverage their quests, which isn’t game breaking when you consider normal scores can run between 50 and 80 points. That said, there are a couple of quests that feel absurdly difficult in comparison without any real offsetting benefit to encourage a player to draft the quest. What makes the side quests amazingly fun though is that many of them reward players with special legendary cards that border on game breaking. Just about every legendary card I’ve managed to unlock has caused by jaw to drop due to their raw power and thematic integration. Without spoiling anything, these legendary cards evoke the same good feelings you get from opening a pack of booster cards an getting an ultra rare foil card. If the design team for Thunderstone Quest is reading this, I WANT MORE SIDE QUESTS AND LEGENDARY CARDS!!! Sadly, there is a price to pay for the dearth of goodies that Thunderstone Quest throws in front of you. Downtime is a very real issue, especially later in the game when your opponents start to string together truly epic turns. This is nowhere as bad as what you get in some games with unending combo-loops like Eschaton (or in AP inducing puzzles like Paperback/Hardback), but honestly, Thunderstone Quest feels best as a 2 or 3 player game. If course, your mileage and tolerance of downtime may vary. Lengthy set up and tear down times aren’t anything new to the series and frankly should be expected. 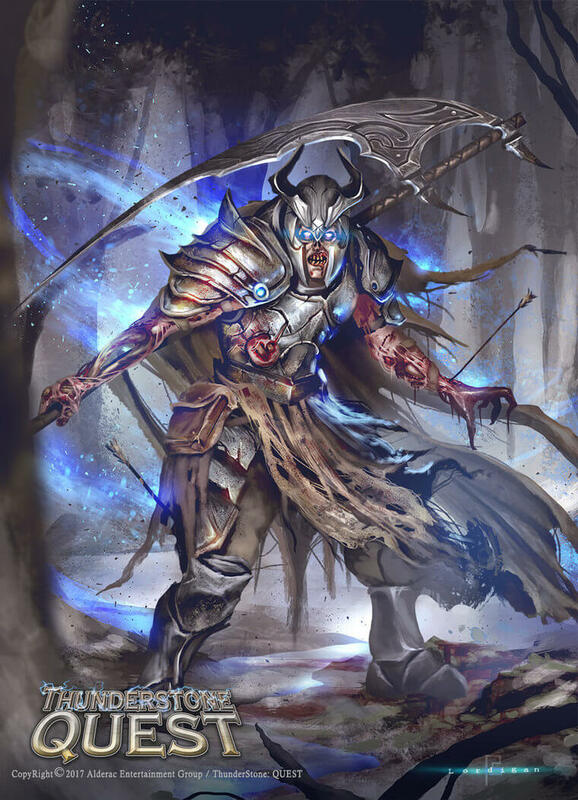 Overall, I am very impressed with the art found in Thunderstone Quest, which (much like the Arkham Horror LCG) is a decent mix of recycled old art and new art. When the art is good, it is very good. The only reason I even mention the art is to warn you that the art assets can be wildly inconsistent. Overall, the heroes, treasure, legendary, and monster cards are all top notch. Items and weapons however are mediocre to astonishingly bad. One of the first weapons you’ll add to your set is the Short Sword, which looks like it was lifted directly from an episode of He-Man. Many of the items and weapons have a cheap cartoony look that clashes horribly with the highly detailed hero art and further conflicts with the CG cartoon art used for many of the new monster images. I have two real points of disappointment with Thunderstone Quest. The first is the Guild Favors cards you can draft at the beginning of the game. These favor cards serve only to award players an extra xp whenever they kill monsters using certain cards. If you are lucky you can squeeze an extra 5 or 6 xp out of them during the game, which may give you 2 or 3 extra points in your favor ahead of your opponents. This is an almost useless amount of extra points. I find the blandness of these cards to be offensive in what is otherwise a properly seasoned experience. The Guild Favors have virtually no effect on the game outcome and are just one more bothersome thing players have to think about. They add fidliness without any real added fun. I can forgive some of the less interesting Side Quests because of the ultra cool Legendary Cards. The Guild Favors are boring and pretty much demand replacement in future expansions. 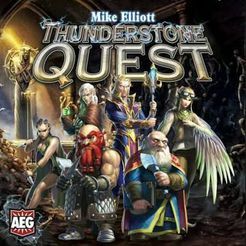 My second beef with Thunderstone Quest comes from the game’s very name and how AEG explains what the “Quest” in Thunderston Quest is. From playing the game, your “Quest” is really your side quest that you draft. 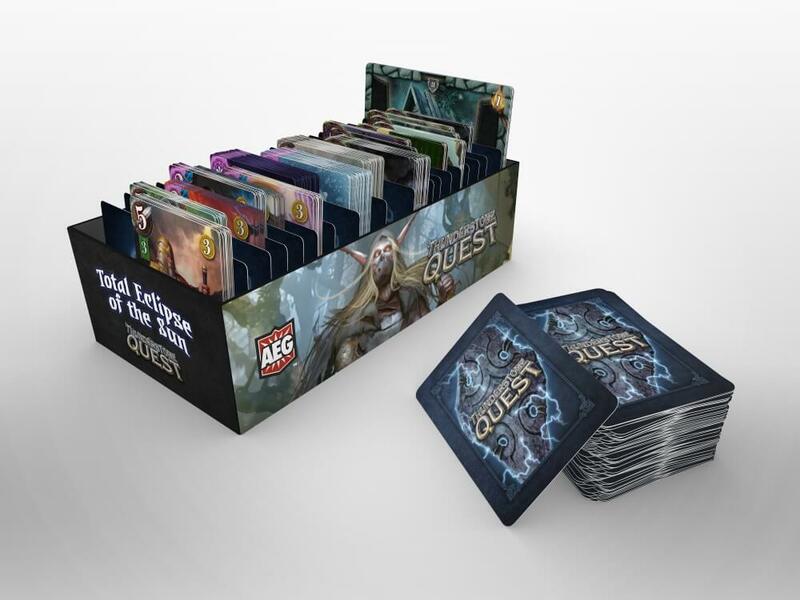 AEG’s marketing team though confuses things by calling each expansion module of cards a “Quest”. This was a terrible idea that is made worse by the half-assed effort made to explain what the product was. Each “Quest” is again, just an expansion’s worth of cards that comes with a 3 game scenario. I am a fan of the idea of the scenario play but for one glaring problem. Each of the three chapters in a scenario starts with a lengthy story passage to establish the setting for your given game of Thunderstone Quest. This is an idea that goes back to the scenario’s AEG released for Thunderstone Advance. This sounds really cool except that there is no proper conclusion to the story. You only get the intro and there is no resolution to the story. So I’m sent on this mission to retrieve an artifact in some scary ruins and I’m treated to some cool mood setting and action sequences, but there is no climax, no pay off naratively speaking. Why bother with the flavor text if you aren’t going to give me a proper ending??? The fact that AEG goes to the trouble of writing up lengthy stories establishes that they understand the importance of narrative in games, which makes the lack of a proper epilogue baffling. I expect a heck of a lot more from a company that pretty much single handedly invented the idea of building cohesive narratives into CCGs. Vexations aside, Thunderstone Quest is an absolute winner of a deck building game. There is very little new or revolutionary going on here. In fact, the game feels like a polished version of a game designed a decade ago (which it basically is). There is much ado about modern deck building designs that incorporate the use of a game board. Thunderstone Quest isn’t trying to be the next new design, and it largely ignores the successes and failures in deck building designs from the past several years. Thunderstone Quest acts as a reminder that the core ideas and designs from early deck building games are very much worthy of our attention. I don’t need Clank!’s dungeon map to have fun with a deck building game. What make’s Thunderstone Quest exhilarating is the design of the cards themselves and the game’s potential to empower players. Thunderstone Quest, like no other deck building game I’ve played, has made me feel like almost every turn is a super power turn. Even now it makes me want to rip off my shirt and scream at the top of my lungs, “I AM A GOLDEN GOD!” For fans of deck building games, buy with confidence, just be prepared to enjoy eating leftovers for weeks to come. PS- For those of you, like me, who aren’t sure what to do about your complete set of Thunderstone Advance, I would suggest you use it to build an Epic Thunderstone card pool and treat it as a separate game. The card pool for Advance is larger than any other Thunderstone pool and makes for a richer variety of cards. So I’m going to keep my Advance cards and play it as a change of pace from time to time. I like the Thunderstone Advance card backs and plastic chits better anyhow.